While the RCMP celebrated its 125th birthday in 1998, a related anniversary went unnoticed the previous year. Sixty years before, in 1937 the Forces first aircraft were delivered. While this date marked the beginning of the RCMP Air Services or Air Services Directorate as it is now called it was not the beginning of their association with aviation. For this one must go back much earlier then you would think. Could We Borrow an Airplane? As early as 1919 Commissioner A.B. Perry suggested that an "air police service" equipped with wartime surplus aircraft might prove useful. The government of the day, more interested in cutting expenses then creating them ignored his idea. As well their reasoning was that since the force had only taken possession of its first automobile in 1916 what did it need with aircraft. Although the Force would not take possession of its own aircraft till 1937 the intervening years would see the frequent use of aircraft belonging to others. The first unofficial use by a member of the force occurred in 1921 when Sgt. H.T. Thorne after having spent weeks delivering a prisoner to Edmonton returned home in only days by catching a flight back to Fort Simpson, NWT. He was a passenger aboard the Junker JL-6 belonging to Imperial Oil, one of the earliest company aircraft in northern Canada. From this point on whenever the force required air transportation they would turn to the private sector or the Department of National Defense. In 1928 an RCAF Fairchild FC-2 was used in northern Quebec to arrest and bring back a mentally disturbed aboriginal man. A second planned flight that year was cancelled when the aircraft being leased, crashed. Probably the most famous use of aircraft was in the hunt for Albert Johnson, the infamous Mad Trapper of Rat River. Bush pilot W.R. "Wop" May, flying a Canadian Airlines Bellanca Monoplane, carried supplies to the RCMP patrol. He later found the killer抯 trail from the air and finally in a series of flights carried out the dead, wounded and living. The most extensive use of aircraft during the late �s and early �s were for what the government referred to as "Preventive Services" on behalf of the Department of National Revenue. In layman抯 language, the stopping of smuggling off the east and west coasts. These occasional patrols began in 1928 but by 1932 the RCMP had been made officially responsible using RCAF pilots and Fairchild 71 aircraft with RCMP constables as observers. Their mission was to stop the rum running from St. Pierre & Miquelon to the New Brunswick mainland and to intercept shore-based boats on the B.C. coast from picking up packages of opium tossed overboard by passing freighters. One must remember that this was the end of the prohibition and the beginning of the depression, a period in which laws were openly ignored and one made a living anyway one could. Birth of an Air Service, "The �'s"
Two events convinced the force that it was time to purchase their own aircraft. One was the DND decision in 1936 that they would no longer supply aircraft for smuggling patrols. With only 135 aircraft in the fledgling RCAF and with a number always unserviceable there were simply not enough to go around. The second and probably more influential reason was Sir James H. MacBrien. Even before becoming RCMP Commissioner in 1931 MacBrien had a strong interest in aviation. He was a private pilot (his Moth carried registration CF-AAA), had been head of the Canadian Flying Clubs and was a former director of Canadian Airways. Without question he knew the value of aircraft. After covering 11,000 miles during a one month coast to coast inspection flight in 1936 using a leased Fairchild he became fully convinced that the Force could no longer depend on others for its aerial needs. Given an opportunity to inspect a newly arrived aircraft, he declared it ideal for RCMP work and promptly ordered four DH-90 Dragonflies. The RCMP was about to officially become airborne. The new Air Service was officially created on April 1, 1937 with headquarters in the North Toronto Post Office. Training for the six new pilots began at the Toronto Flying Club but all were already seasoned former military flyers. The first of the Dragonflies were delivered on May 5 in the dark blue and yellow scheme which would remain the basic colors of their aircraft till about 1970. Delivery of the remaining aircraft occurred quickly after: MPA (5.5.37), MPB (5.29.37), MPD (5.26.37) AND MPC (7.13.37). MPC had been involved in a landing accident during trials in mid April necessitating repairs. Airport in Ottawa. Unfortunately on a flight back from Edmonton in 1939 (10.30.39) MPE was wrecked when a defective oleo leg collapsed upon landing at Sioux Lookout. The surviving wing was recovered and mated to a new fuselage and MPF joined the small fleet. War was just around the corner and with its coming, the Air Service would all but disappear. The Dragonflies and their pilots joined the RCAF as twin engine trainers leaving only the Norseman and one pilot to fly patrols around the Hudson Bay and the Arctic coastlines. The Dragonflies would never return to the RCMP, being sold to private interests before wars end. The Air Section is Reborn, "The 40's and �'s." It wasn抰 until 1946 that the Air Section was reformed, this time with two new Beechcraft D18S aircraft (MPH & MPI), the pre-war Norseman and an ex RCAF Grumman Goose (MPG) which would serve its illustrious career on the west coast. The Goose would have the distinction as the longest serving aircraft in Forces history, 49 years. In the early 1990's when the government announced that the Goose was to be replaced the people of its home base in Prince George started a "Save the Goose" campaign. The final result being that MPG was added to the National Aeronautical Collection in August of 1995, a fitting end to a noble history. The reborn unit continued to transport police personnel, assist the marine section when needed and expand the Forces role in the Canadian arctic. For the remainder of the decade the fleet would continue to grow. In 1947 two new aircraft were obtained, a Fairchild Cornell based at Rockcliffe for training purposes and a Stinson 108 based in Regina for use in northern Saskatchewan. The Stinson, MPJ, would carry the standard dark blue with yellow wings and trim while the Cornell would be painted overall yellow. In a later life MPJ would crash, its remains finally recovered years later and during the early �'s a restoration was undertaken by the British Columbia Institute of Technology, where it still flies today, In 1949 the aging Norseman (MPF) was traded in on an improved Mk V model (MPL) which would remain in service till traded in on an Otter ten years later. Before closing out the �s the Force would add the first of its fifteen Beavers. This rugged STOL aircraft was ideally suited for the forces operations in the north and the first one (MPM), operating out of Winnipeg, even carried NO STEP and other warning stencils in Cree to prevent overly curious northern natives from injuring themselves or damaging the aircraft. During the 1950's the Force continued to increase the number of detachments until a dozen bases stretched from the east coast to Vancouver where former B.C. provincial police Beaver (CF-FHW) became the first aircraft not to carry an MP registration. Fleet expansion during this decade would see the end of the Norseman era when MPL was sold to Bradley Air Services in 1959 but an increasing expansion in Canada抯 home- grown Beavers and Otters. Between 1949 and 1960 nine different Beavers would carry RCMP colors and six Otters would be added to the fleet. 1958 saw the air service抯 first fatal accident when Vancouver based FHW crashed near Kamloops while hunting for a murder suspect resulting in the death of all aboard. A second Beaver MPQ was lost a year later, this time in a Regina hangar fire, fortunately with no loss of life. Other notable aircraft to be retired by the end of this decade was the Stinson 108 which later crashed and the Cornell which was sold in 1957. By the end of the decade the Air Section had also been elevated to become a full service division. The Force Modernizes, "The �'s and �'s"
The 1960's was a period of modernization for the Air Division. The beginning of the decade saw the need to bring three former RCAF Expeditors up to civilian standards to join MPH and MPI, which had been purchased in 1946. 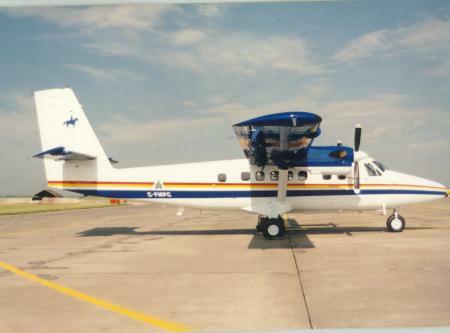 But compared to many of the division抯 aircraft these new Expeditors would have a relatively short life in RCMP service, MPA lost in �, MPB sold in � and MPC gone by 1970. It is interesting to note that they carried the original DH 90 registrations. One other unique feature of the five Beachcraft is that they are the only aircraft to remain in natural metal finish throughout their entire service history. In 1962 new radios equipment was added to all service aircraft making it possible for officers to communicate to all ground stations, police vehicles and related rescue services. The aircraft were becoming an integrated part of the larger package of police work. The sixties would not be without their tragedies. The division抯 second fatal crash came in 1963 with the loss of Beaver MPO and its crew during an attempted landing in the Yukon. A hangar fire again claimed a division aircraft, this time Expediter MPA in 1967. It抯 replacement would bring the force into the modern age of aviation when a Beech craft 65A90 King Air (CF-VMW) was purchased. This twin engine, pressurized, fully instrumented aircraft would prove particularly useful during Canada抯 Centennial Year when demands on the force for visiting Heads of States security would stretch the forces resources. Beavers played a role in these activities as well, providing security patrols for the Queen during her 1967 visit. Nineteen sixty-six also saw the replacement of Regina抯 lost Beaver (1959) with another, also carrying the registration MPQ. This aircraft was purchased for the exclusive use of the Crime Detection Laboratory and would eventually share hangar space with MPC, the second Twin Otter purchased in 1971. MPQ would remain in Regina till 1986 when it was destroyed in a fatal crash in northern Saskatchewan. MPQ flew for several years in a highly polished metal scheme before being repainted in the then standard white and blue scheme around 1972. To my knowledge this is the only Beaver to wear bare metal although at least one of the Turbo Beavers is reported to have also been in bare metal for a short time. This was probably Calgary based MPA, the first of the three to have flown with the force. It was purchased in 1968, only two years after MPQ. In 1966 the Air Division headquarters were also moved from the smaller Rockcliffe airport to a new headquarters building at Ottawa International. The early 1970's brought about a new name and a new look to the Force. In 1972 the RCMP Air Services became the Air Services Directorate. In the first two years of the decade six out of eleven Twin Otters were purchased and these twin engine turbo props would quickly prove as valuable as their older siblings, the Otters and Beavers. With the Twin Otters also came the new look, overall white with dark blue wings and a broad blue outlined by narrow yellow stripes that started at the top of the fin and extending onto the fuselage to the nose. The value of DeHavilland抯 new twin was quickly proven when in both 1970 and 1973 the Queen and her family used these rugged aircraft for their tours of Canada抯 remote north. The reliability and versatility of these aircraft during their first years of operation quickly pointed out the inadequacies of the older aircraft in the fleet. First to go were the last remaining Expeditors, although MPI was kept on as late as 1973 to provide advanced training. By the end of the decade five of the remaining Beavers were gone and only three of the remaining Otters were still in service. They had all been replaced by the purchase of the nine Twin Otters on strength by the end of the decade. The crash of an Otter (MPZ) at Deer Lake, Nfld. in 1971 provided the Force with the long sought opportunity to add a helicopter to the fleet. Bell 212 (CF-MPZ) would prove ideal for the rugged, notoriously bad weather of the coastal areas of Newfoundland and it was hoped that twin engines would provide a greater degree of safety. Although the use of rotary aircraft has proven very successful, the 212 proved too expensive to operate and it was traded for a Bell 206 in 1980. The force continues to operate a small fleet of nine rotary aircraft made up of Jet Rangers, Long Rangers and two Aerospatiales 350's, just recently purchased. All helicopters would also be painted in variations of the current scheme at the time of their purchase. By the end of the decade the total fleet would consist of 27 aircraft divided between three Inspectorates, fixed wing operations for western Canada based in Edmonton, fixed wing operations for eastern Canada and rotary wing operations for Canada based at headquarters in Ottawa. Tasks for the fleet remained largely unchanged, transportation of personal and prisoners, search and rescue, and some coastal patrol. A Period of Replacement, "The �'s and �'s"
With the Air Divisions roles now clearly established and hours of operation mounting up on the aging Beavers and Otters the 1980's and �'s have been periods of replacement rather than expansion. The last Beavers were sold in the mid 1980's, excluding MPQ. The last Otter (MPO) soldiered on till 1992 when it was obtained by the Yellowknife Air Cadets but it has since been sold to U.S. interests. The Force had always turned to DeHavilland for the rugged aircraft needed on short unprepared landing strips but with the Beavers and Otters gone and the Twin Otter line closed down an aircraft that could perform their roles would be difficult to find. The aircraft finally chosen for the job was the Cessna 208 Caravan which had been designed from the onset just for this role. The first Caravan (C-GMPB) was delivered in 1986, a second in 1987 and the fleet currently stands at four with aircraft based in Vancouver, Regina, Montreal and Prince Rupert, the later replacing the RCMP抯 most famous aircraft, the 49-year serving Grumman Goose. While one might question the reason for "RCMP Airlines" the biggest aircraft in RCMP service is in fact a former airliner, a DC-8-54 (FTJO) purchased from Air Canada in 1985. The airline won抰 get you very far as the aircraft is non-operational and the cannibalized hulk, located at Dorval, is used for SWAT training. The Force has seen the need for some form of high speed transportation since the mid �'s. A Cessna 550 Citation business jet was purchased in 1987 and while the Force evaluated the purchase of a Canadair Challenger it was determined to be too big and expensive for their needs. The final choice for a second jet was a used IAI Westwind which is based in Ottawa while the Citation flies out of Edmonton. A second Citation was added in 1995 so to some degree the RCMP have become a mini airline. These aircraft are used for high speed staff transport from the eastern and western headquarters. A new and still current scheme was introduced in early 1994, overall white with dark blue wings but the blue fuselage stripe has been replaced with a red/yellow/white/blue one. Most noticeable is the blue silhouette of a horse mounted officer on the tail. With the last of the Beavers and Otters gone and the Twin Otters between thirteen to twenty-eight years old the Force have begun to look at other aircraft. One such aircraft is the large single engine Pilatus PC-12/45. The first of these Swiss built turbo props was purchased in early 1997. While it will be based in Winnipeg its range will take it into northern locations where its performance and value will be carefully monitored as the Force considers its air needs in the years to come. In their sixty-one years of official operation the RCMP have operated 26 different aircraft types and models. The longest serving aircraft and only amphibious aircraft was the Goose at 49 years but the overall average service life of an aircraft type is still a respectable 15 years. In credit to their rugged bush heritage most of the DeHavilland aircraft have served from 16 to 25 years and it will be a sad day when the last Canadian designed and built DeHavilland leaves the inventory. It is clear from these numbers that the Force have chosen their aircraft carefully over the years and that the Air Division has become an indispensable part of Canada抯 national police force.